Even monkeys can have late-in-life babies! A Titi monkey who is the oldest mother of her species to give birth in a North American zoo welcomed her ninth offspring last weekend at Lincoln Park Zoo, officials said. 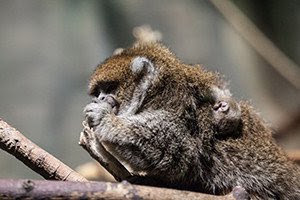 The new baby monkey, weighing only a few ounces, was born Aug. 18 to seasoned Bolivian gray Titi monkey parents Delasol, 21, and father Ocala, 15, according to a news release from Lincoln Park Zoo. -- Meet, marry and make a baby: That's how it's supposed to go, right? What happens when you start trying for a family ... and trying, and trying some more? How far do you go to achieve your dream of having children? So Close is the heart wrenching, exhilarating, devastatingly funny story of Tertia Albertyn's battle with infertility. Tertia wanted a baby so badly she went through nine IVFs. Most people give up after the third. I don't think I am being brave at all. I am just too terrified NOT to try again. In her worst nightmare she could never have imagined that making a baby would take her four years, each treatment bringing her and her husband Marko closer and closer to creating their family. During Tertia's journey everything that can go wrong does go wrong. Until, finally, everything goes just right. Tertia is as hilarious as she is irrepressible, as approachable as she is knowledgeable. If you are struggling with infertility, have triumphed over infertility or have felt empathy with someone who is going through this experience, you will find a friend in Tertia.